The state's name means "Land of the Indians", or "Indian Land"
The state of Indiana was inducted into the U.S. As an official state on December 11th, 1816 and was the 19th state admitted into the country. Indiana is the 15th ranked state in terms of population with roughly 6.5 million people residing in the state, and it is ranked the 38th most extensive state in the country. The capital of Indiana is Indianapolis which is also the largest city in the state, and happens to be the second largest state capital of all the states in the country, and is the largest state capital located on the east side of the Mississippi River. Indiana was first inhabited by Native Americans for thousands of years, far before it actually became a territory. Perhaps the best preserved ancient earthwork mound sites in the country can be found in the state. The name of the state has the meaning “Land of the Indians” or “Indian Land”, and dates back to the 1760s. 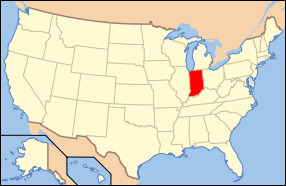 Indiana's northern region was first settled by people from New York and New England, while the central area was inhabited by people migrating from mid-Atlantic states, and the southern end of the state was inhabited by people primarily from Tennessee and Kentucky. The economy in the state present day is very diverse, with an overall gross state product worth $214 billion in 2005 alone. Indiana also has man metropolitan areas housing populations over 100,000 as well as several smaller cities or towns. There are also many major sports teams and events located in the state such as the Indianapolis Colts, Indiana Pacer's, Indianapolis 500, Purdue Boilermakers, Indiana Hoosiers, Notre Dame Fighting Irish, and the Butler Bulldogs. Indiana also is known for its several college universities which are ranked with the best in the country such as Purdue University, University of Notre Dame, and Indiana University. Indiana has a few major rivers running through or along it which include the Ohio River, White River, Tippecanoe River, and Wabash River. The states highest point of elevation is Hoosier Hill with a peak height of 1,257 feet above sea level. 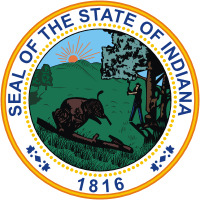 The state motto is known as “The Crossroads of America” and the state song is “On the Banks of the Wabash, Far Away”. The state bird of Indiana is the Cardinal, and the state flower is the Peony, while the state tree is the Tulip Tree. Whether it is the education, the economy or the sports, Indiana is clearly one of the more popular states in the country and continue to be a core part of the countries backbone.